There is a lot of variety on the market when it comes to trenchers. There are those you can ride on, those you walk behind, and even implements that attach to mowers, skid steers, and tractors. While we are happy to offer you any trencher you need, our focus is on walk-behind trenchers. Walk-behind trenchers come in two categories: chain-type and wheel-type. 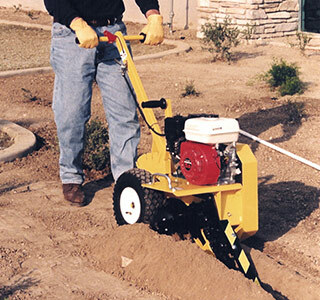 Chain-type trenchers cut trenches with a 4- to a 6-inch width and a depth of up to four feet; they do so at a low speed. Wheel-type trenchers cut more narrow trenches and do so at a high rate of speed, reaching a depth of up to 12 inches. Selecting a trencher for rent depends on what you are going to use it for, the soil you will be digging in, ease of operation, and the size of the space you will be using it in.